Let's Make Beer! A complete Fermentasaurus start-up package for making beer. Includes the ingredients required to craft your first beer. 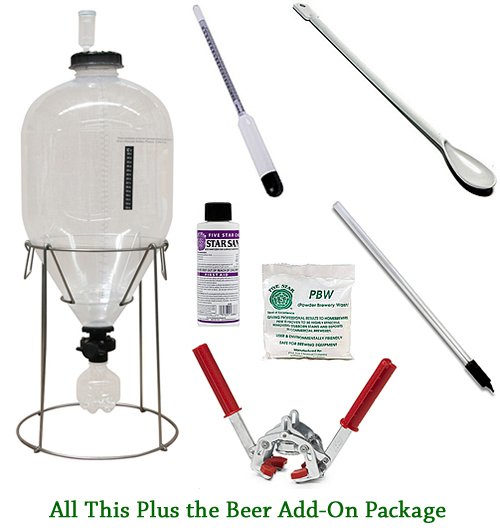 Fermentasaurus Starter Kits are the easiest way of making quality Beer, Wine, Cider or Mead. These kits provide everything needed to get started. Fermentasaurus Starter Kits replace buckets and carboys. You have less work because you only have to clean and sanitize one container plus you avoid heavy lifting. The whole fermentation process is carried out in the Fermentasaurus and you even bottle directly from it! The Fermentasaurus Starter kit is hands-down the best way to start your new craft.